French Foreign Minister Calls For UN Security Council Meeting Over Supposed Chemical Attack In Duma 2.6 out of 5 based on 5 ratings. 5 user reviews. On April 7, France’s Foreign Minister Jean-Yves Le Drian condemned the supposed chemical attack on the Duma district of Syria’s Eastern Ghouta and called on the UN Security Council to hold an emergency meeting to discuss the incident, according to Reuters news agency. Le Drian went on and said that Paris would assume all its responsibilities in the fight against the proliferation of chemical weapons. We recall France’s President Emmanuel Macron vowed to respond with force to any chemical attack in Syria on numerous occasion during the last few months. Several Syrian pro-opposition news outlets claimed that the Syrian Arab Army had been behind the supposed chemical attack on Duma district on April 7. However, these outlets are yet to provide any real evidences to support their claims. 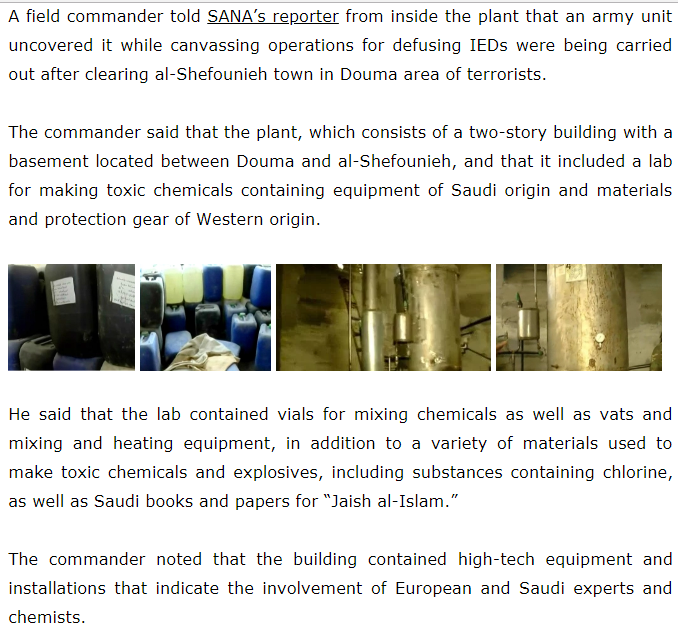 Previously, the Syrian Arab Army (SAA) and the Ministry of Defense of Russia announced that more than 40 tons of toxic chemical materials, including Chlorine gas, were discovered in the liberated areas around Duma district. A fact that was intentionally ignored by the mainstream media. A US-led military attack against the SAA is highly possible now, according to some Syrian experts, who also believe that Russia might not tolerate such acts this time. The zionists have their fake narrative in place to demonise Russia and Syria for false flag chemical attacks,in little britain and now Syria.They think that people are so stupid to believe their lying BS,but they will fail big time if they attack Russian service men in Syria,,as Russia has already warned them about acting on lies.This also proves that france,uk,germany usa are zionist occupied countries whose people are only cannon fodder for the zionist mafia,who will risk the lives of millions to achieve their evil agenda.Zionism must be exterminated before humanity is. that is the tip if the Iceberg.. those 81mm mortars are damning. “PETN” on whiteboard @ 4:14 = Pentaerythritol tetranitrate , used in Semtex and other explosives. Or , it could refer to the “Project Earth Television Network” of Germany , and these are just the innocent notations of jihadists discussing business or current affairs. Or NATO spec ops and intel? Nebenzia will sort them out. Here we go again! Another futile UNSC meeting to slow down Syria’ s effort to get rid of Salafist/ Wahabbi head choppers in Duma once and for all.. The Skripal Mosaad Hox is collapsing, and the zio puppet May government is in trouble, so Mosaad need to cover it up with another hoax. Don’t look here! Look over there! The very sad state of France today. From a free people fighting for freedom, they are now just another Zionazi vassal state with a young idiot leader who seems to have only just graduated from high school . . Forget the massacre of Palestinians and Kashmiris and lets go to attack Syria on fake CW attack what a moronic terrorist leaders of this world. I wonder what the Jew freaks have offered the French to be their newest lapdogs in pushing this phoney gassing fraud? A new pond for macron and his mates. only idiots will beliieve CW propaganda. hello after failure UK CW allegation?… where is your brain world leaders? The French want to whip the Brits .. the sh!t is hitting the fan with the discovery of VX mortar shells manufactured by the Britts.